What is North Carolina Sea Grant? Ask 10 different people, and you’ll get 10 different answers. These candid insights come from Joe Ramus, Sea Grant advisory board chair; Ernie Foster, captain of the Albatross Fleet in Hatteras; and Sara Mirabilio, a fisheries specialist with Sea Grant. They were interviewed along with other staff, board members and community partners for a new project harnessing the power of video to spread awareness of Sea Grant’s work. Sea Grant advisory board chair Joe Ramus talks about Sea Grant’s role in sustaining the coast for future generations. Photo by Diana Hackenburg. In contrast to traditional outlets, social media continues to provide a means to reach a wide audience. Videos are the most powerful content on many platforms, including Facebook, where views of videos exceed 1 billion every day. A picture may be worth a thousand words — but a video is worth 135 percent more engagement on Facebook. Beyond social media, videos harness the power of words and images to tell unique stories, like that of Sea Grant. That’s why for this project, the communications team paired up with expert storyteller Rick Sullivan. 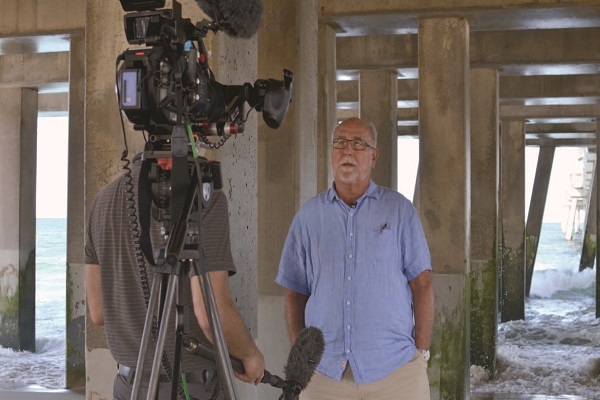 Sullivan, a veteran TV reporter and producer for UNC-TV’s North Carolina Weekend, previously worked with Sea Grant on videos for projects in Hyde County and Nags Head. Still, he was able to approach the project with an outsider’s perspective. “When I first heard about North Carolina Sea Grant, I figured it was an organization that helps commercial fishermen navigate the many laws, regulations and challenges they encounter at North Carolina’s bountiful coast,” Sullivan recalls. The interviews took place over a few days of filming on the coast and at Sea Grant’s Raleigh headquarters. Together, they form the heart of two videos that explain not just what the organization is, but why it matters — and how it benefits all North Carolinians. This breadth of work has impressed Sullivan. “I’ve been filming various projects at the coast for the past five years and I continue to discover the organization in places I had never expected, doing work that goes far beyond the commercial fishing boats where I first heard the name Sea Grant,” he says. The videos will premiere as Sea Grant hosts the North Carolina’s Coastal Conference in April. They also will be posted online at ncseagrant.ncsu.edu/about-us. Staff, as well as board members and partners, anticipate getting additional mileage out of the project by showing the videos at seafood festivals, community meetings and presentations. Though a bit overstated, the fisherman’s sentiment reflects how Sea Grant has quietly flown under most people’s radar for over 40 years. While these videos may not go viral, they should get people started talking — and make it hard for Sea Grant to remain a secret much longer.